9% “still pick mistletoe”. Really?? According to a recent poll 9% of Brits still pick mistletoe. Which sounds good and reassuring for us mistletoe promotors – except that I don’t believe it for a moment. 9% hang it up – ok, 9% pick it? No. This is the same poll, reported in many papers (eg the Telegraph, the Metro), that claims 65% of Brits have champagne breakfasts on Christmas Day – which many commentators have pointed out seems unlikely. But why don’t I believe the mistletoe figure? Well, mistletoe is fairly rare over most of the country (see dotmap left) – virtually unknown in Scotland Wales and Northern England, and in most of the SE and extreme SW. Where it does occur in those areas most is either on limes in parks (and therefore unreachable) or in a few private gardens (and therefore unavailable). It’s only common on low-growing trees in Somerset, Gloucestershire, Worcestershire and Herefordshire – but do those areas represent 9% of the population? Maybe, I s’pose, though I doubt it. And do people in these areas really go and pick it – it’s still all on private land – and it’s much easier to simply buy it. And would they have been surveyed evenly across the country – could all the "9%" simply be from this area? The survey, by UKTV and championed by their chef Brian Turner was apparently only 3000 adults, and I suspect most were more south-easterly than mistletoe country. So why would they say they still pick mistletoe – if they don’t? Well, maybe they like to think they do, maybe they mean they pick plastic mistletoe from Woolworths, or maybe they simply don’t know what mistletoe is (do a google image search on mistletoe and you’ll find a depressing number of results are actually holly… ). Yellow mistletoe? Or the Golden Bough? In reality all northern European mistletoe goes a bit yellow around this time of the winter – it’s all Viscum album and it’s all green, and it’s all occasionally yellow too, wherever it grows. Now normally I just let these comments pass me by, as they’re harmless (unless you’re trying to sell French mistletoe in Tenbury) and rather quaint. But this year, some of the TEME mistletoe stock has been rejected by wholesale buyers – because it’s ‘yellow’ and their buyers won’t like it. This is a new one on me, people actually rejecting the yellowy green stock, and I’m not sure how seriously to take it. I harvested some of that material, and I thought it was rather spectacular – and some is always like this. So just what is the problem? Part of the problem may be the association of yellowish stock with the male plant – which tends to be the first to turn yellowy each season. 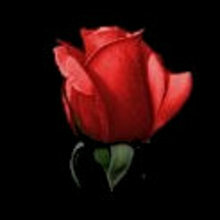 And the male plant has reduced value already – as it has no berries. So maybe wholesalers reject yellow as they think it’ll have no berries. But there are many truly stunning yellow-green female branches out there (trust me, I’ve seen them – but don’t have pics to upload yet – will look out for some) and they’re overwhelmed with berries. Lovely stuff – beautiful material. So why reject it? Perhaps it’s the word ‘yellow’ – making people think the branches are off/old/dead/decaying? But they’re not, they are perfectly healthy and very attractive. Get your Golden Mistletoe here. Sounds better already doesn’t it? For more info on the Golden Bough, you’ll have to read Sir James George Frazer’s epic book on the subject. You’ll find the abridged (1922) version online here. Tuesday 11th December. 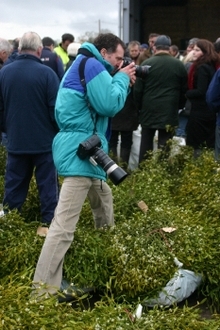 The last of the 3 Tenbury Mistletoe Auctions for 2007. And this time I’m there for 05.30 hours and it’s very very cold (-2.5C) and very dark. The mistletoe looks good though, all sparkly and frosty! Why so early? Well, BBC Breakfast TV are here to broadcast live links during the show (6.00 to 9.00am) and this year I’m acting as a sort of press officer for all things Tenbury Mistletoe. Though I’ve always fielded the press at mistletoe time, my role as Publicity Officer for the Tenbury Mistletoe Festival this year has rather formalised the role, even if most of the coverage is about the auctions (for which I hold no brief at all!) not for the Festival. So it’s a little awkward – as the messages I want to get across (from the Festival point of view) – about Tenbury’s tradition with mistletoe and about Tenbury’s recovery from the summer floods, are rather lost as (at the auctions) I have no say on the angle the press are coming from or what the interviewees talk about. My personal mistletoe ‘agenda’ items for this season – better management of mistletoe (ie sustainable harvesting etc) and the new work on the national mistletoe survey data are far too complicated to even try to fit in today’s circumstances – so I don’t try..
Just as well really, as the live 6.20 link comes and Nick isn’t here so I stand-in – only to say a few words about the holly berry shortage (they don’t want anything else and its’s all very rushed). One theme they want info on is did the floods cause the berry shortage?? Er, no, what would be the trigger there chaps? Turns out later in the day they’ve all (newspapers and all) picked this angle – which is clearly utter nonsense. They seem to believe all the holly trees of the area somehow got flooded (extremely unlikely!!) or that the floods near the river somehow affected the holly everywhere (er, how??). Talk about clutching at straws – maybe people think holly grows as short crop on the ground???. This clearly indicates that next season Tenbury needs a more co-ordinated media approach, covering Festival, Auctions and mistletoe/holly state-of-the-nation information. It would be so much better for Tenbury and the media. Anyway Nick has arrived for the 7.20 link but even he only gets a chance to say ‘yes holly is expensive this year’ and then that’s it – for the 8.20 link they don’t ask for any input. But I continue in my unofficial minder role until the end, persuading arriving buyers to switch off their engines when pausing next to the camera. And it’s still very cold – but at least we have a spectacular dawn. It’s soon apparent that we have a large posse of press photographers here today – from all over the place, and so maybe we’ll get that national newsaper coverage after all (the auctions haven’t been covered at all so far by the national papers (I think)). But there’s definitely this weird pre-occupation with holly berry shortages ’caused’ by the floods. Doesn’t bode well for sensible coverage! A little light relief when I get a call from a chap at the Star wanting to know about the ‘mistletoe shortage’. 0/10 for him so far! But they’ll be ok, lots of good footage and they’re off to see Stan Yapp in the afternoon. They thank me profusely as they leave – but all I’ve done is help them (over several weeks)with contact details – but then I s’pose that’s what they expect in a press officer role. I had assumed, up ’til almost the last minute, that they’d want to talk to me about mistletoe but apparently not… Must try harder! Prices by the way – just as before – high for holly, low for mistletoe. And a lot less mistletoe this week – growers are obviously deciding the prices aren’t worth it. So maybe there could be a shortage of mistletoe after all??!! 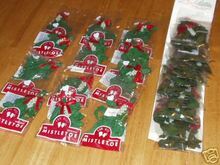 My listing of online mistletoe suppliers in the UK last week was somewhat dismissive of the Ebay suppliers, and I’ve been taken to task a little by the Mistletoe Lady, who is a year-round mistletoe seller (incl grow-kits, in season), based in Cheltenham, and should really be added to my listing of non-Ebay suppliers. You can find her details here, and a list of her current sales items here. Grow your own feature in the Telegraph – Again already? Well. here’s a first, not only do we have a sensible feature on how to-grow mistletoe in the Telegraph on Saturday but we have another one, equally sensible, on Monday. What’s going on? The same national newspaper runs the same feature over 2 consecutive days? And such a distinctive feature too – you’d think the editor might just notice. Each by a different journalist of course, and each with some differing content of course. But I’m stunned – it’s very rare to get a grow-your-own account that doesn’t fall for the old gardening book nonsense about cutting nicks in bark, covering with soil/moss/cloth etc. To get two good accounts in as many days in the same newspaper is, well, weird. The cut-a-nick-in-the-bark etc nonsense is still propagated (geddit?) by BBC Gardeners and the Royal Horticultural Society – both of whom should know considerably better. One day they’ll learn. But back to the Telegraph pieces. The first, by Graham Rice, is simply about growing it, and suggest that you can buy your GYO kit from Tenbury English Mistletoe Enterprise (TEME). The second, by Bunny Guinness, has a bit mmore background info – but is basically just another GYO guide. But Bunny advocates a different GYO supplier – Nick Wheeldon of Lincolnshire and does bring in a new angle – Nick is now selling trees ‘ready-infected’ with mistletoe. Now that is a different ball-game altogether – and I’m very pleased (and very impressed) that Nick has started this – a scheme which has been discusssed in mistletoe society?/circles? for some time. 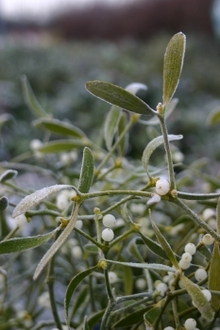 Trees cost £50 with at least three small germinated mistletoe plants growing in them. Alternatively (if buying for Christmas) consider the GYO Kit Gift Card from TEME – which at least gives something (an attractive card) to hand over at Christmas, albeit only containing a voucher to send in for a kit to be sent out, in February. The opportunity to buy mistletoe online in the UK is relatively new – in fact I don’t think you could at all until TEME began trading back in 2005. Over in the States things were different – but then so is their mistletoe – which is small, compact in branching, and easily slips into an envelope. But here in the UK, where the kissing custom began, we use real mistletoe – the proper species of tradition. First and foremost has to be TEME – Tenbury English Mistletoe Enterprise, who despite my being involved with them and therefore arguably biased, must be regarded as the ‘original and best’. Though only 3 years old. I think this is the only outfit that can honestly say that mistletoe is largely picked to order – from tree to delivery within 2-3 days. Next up there’s InterRose.co.uk – who’ve been in the mistletoe mail-order business for at least 2 seasons, selling Tenbury stock from their base in Suffolk. They major in, er, red roses, but branch out (geddit?) into mistletoe at Christmas. And then it all gets a bit vague. InterFlora have a Google ad that pops with a mistletoe keyword, but if you search their site for mistletoe, you just get a note saying "did you mean ‘nestled?’". So nil points for the grand-daddy of floral mail-order. But there’s a new boy on the block this season. 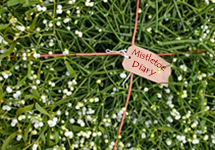 Mistletoestore.co.uk‘s site has just launched, and sells ‘Luxury’ mistletoe. Am not sure where they’re based (the url is registered in Manchester) or how well they’ll do, as the website takes an age to load (optimise those pics please! ), and isn’t particularly straightforward to read (lots of L to R scrolling, and new window opening) when loaded. But I assume those are teething troubles – and will be solved in due course. Good luck to them. Lastly we have the usual suspects selling mistletoe on Ebay – but I don’t count them as they’re not (yet) volume sellers, largely just selling a few sprigs. Despite all the TV interest in the auctions so far this year, there’s not been a lot in the newspapers. A bit in the local papers around Tenbury – good coverage of the Mistletoe Festival in the Tenbury Advertiser (though not yet in their online ed), but ousted by Worcester Christmas celebrations in Worcester News. And apparently I made the front page of the Shropshire Star on 27th Nov – but I’ve not seen that, only this rather unlikely explanation (‘the birds have eaten them all’) for the lack of holly berries this year. Why not just admit it’s been a poor year for holly berries? Not much in the nationals. The Daily Mail promised a piece on buying mistletoe online last weekend – but that came to nothing. The Daily Telegraph sent their photographer to this week’s auction (see pic) but I don’t think they used a pic, apart from in their online edition, (scroll through to the 8th image) and that’s credited to the Reuters man, so I’m a bit confused. But the Telegraph have run a piece on how to grow your own, and it’s not a bad piece either, resisting the usual rubbish about cutting nicks in the bark and instead telling it like it really is, and how to plant it like the birds do. As Stan Yapp likes to say ‘ the birds are the professionals [at planting mistletoe], we are just the amateurs’.